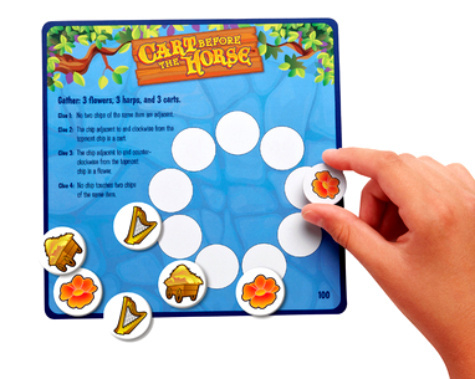 Toys As Tools Educational Toy Reviews: Review & Giveaway: Cart Before the Horse: "Control Your Mental Effort"
One mark of a good educational game is when the educational part is rather understated. Kids know when something is educational so you can't really deny when something promotes critical thinking however, it really does pay to not be so... in-your-face about it. Cart Before the Horse is one such game. There are about 110 puzzles in the shiny tin box and when opened out come these little pictures of carts, flowers, harps, coins, and other items on little discs. To me, that is significant because brain games should not look intimidating. Nothing about carts, horses, and chickens shouts out, "I am a brain game. I will make you feel small." This is one of those games where you are asked to place this here but not next to that and at the left of this and put this thing above that thing but not in the middle and not on the right edge. Of course, it can get confusing but to level the playing field for the kinesthetic learners, you are able to place your answers via discs with your fingers instead of writing them down. I find that moving stuff around is quite refreshing and stress-free when trying to solve problems. From the get-go this game surprised me because I never expected my five-year-old to love this game but Cart has his heart. 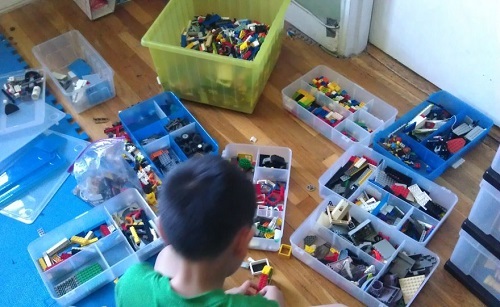 He is actually not big on spatial thinking but he is very heavy on reading directions and following steps in a sequence. My older son, for whom I got this game however, didn't play with it that much and until I spoke to Susan Schwartz, I had no idea why. 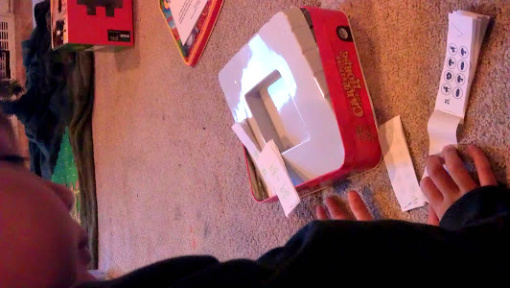 The Cart (as I like to call it) is all about spatial reasoning and he is a super-spatially minded kid. So what was happening here? Only a learning specialist like Susan Schwartz could unravel this puzzle. But this time, I had the added honor of hearing the opinions of her students ages 6-9. Six students diligently ventured to learn the ins and outs of this game. Okay, what do you think? Try to do this by yourself. Print out my pdf and try cutting out the discs. Ask your child to try it out too! 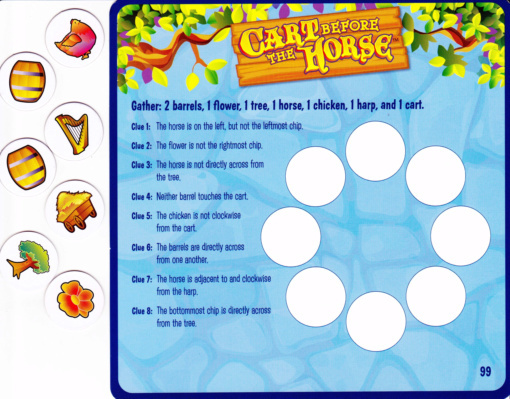 What Did Susan's Students Say about Cart Before the Horse? you have to "control your mental effort"
When Susan asked the students if they were to vote yes or no about the Cart being a fun game or not, all six students voted YES! Who are these students? Let's just say, they always beg Susan to let them play Pix Mix! It's interesting that the kids like the circular puzzles the most. They are the hardest. Click HERE to try this out at home! In my little mind, I didn't think that my kindegartener would be able to handle Cart Before the Horse Not only because of the language (you have to read) but also because he is not exactly the master of spatial reasoning. He's more of a verbal sequential kind of kid. Thanks to Susan and her students, I now have a better idea of how to make this more successful. First off, Susan's students had said that the game is best played in a group. This is surprising because the Cart is essentially a one-player game but Susan's students not only played it individually, they also played it in groups of three. How fun! Then I realized why Number 2 liked the game more than Number 1 did. Since Number 2 can not read many of the words in the game, I always stayed by his side and helped him solve the problems. We often just played as a team. I asked Susan if she recommended this kind of play with Cart. “I think that children need both," she said. "It’s fun to play with an adult just like it’s fun to read with an adult because it’s a bonding experience." Parents are the best carrot.... better than candy and screen time privileges. You may be groaning but I've got good news: Cart Before the Horse is fun for grown-ups too. You won't be bored! This is so embarrassing. See if you can catch my RIDICULOUS mistake at Level 1. At least he's five... what's my excuse? Are You More Number 1 or Number 2? I really thought that the spatial aspect of this game was the big draw and Susan did agree with me that spatial thinkers may have an edge in playing this game. However, we both saw that kids with language strengths also found this game attractive. She told me about one of her students who is very "language dominant - not visual" and really had to keep putting down and moving the pieces around, and reading the directions again to see if it made sense. "So I think it could be enhancing to those who don’t have good visual and spatial skills because they need to do both: using language and using the visual cues. Cart Before the Horse comes with an answer key but the answers are all next to each other and I really like when kids can check over their work so I made a flip book answer key for him by just photocopying the answer key and cutting and stapling the papers together. 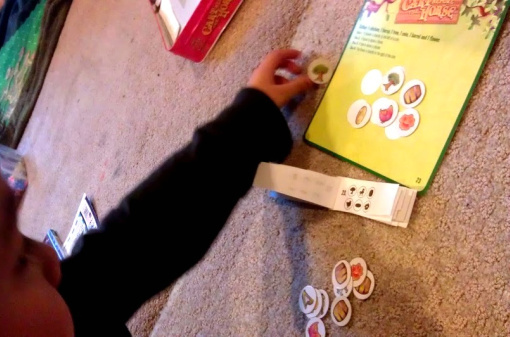 Still Susan feels that if a child has really good visual and spatial skills then it is still fun to get the mental image and just try putting the pieces down. (I have never done that... too hard!) Thus, Susan was able to draw even more conclusions. "I think it could work for both kinds of kids." Isn't that the best kind of toy story ever? I love when one toy or game can have such a strong draw that it can motivate a child to work on areas in need of improvement. But it's not everyday when you find that the same game can do the same thing for a child with what you can consider as a completely opposite skill set! When Susan's student said that you have to control your mental effort, she thinks the student was describing how one needs to hold more than one direction in their heads as they decide where each disc is located. That's a working memory component. Cool! What does this all mean? It means that Cart Before the Horse is a heck of a good game. A one player game that's more fun when played in a group? Check! Helps verbal kids with spatial reasoning? Check! AND helps spatial kids with verbal reasoning? Check! Impossible, you say? Yes, it's all possible! Check! I do hope that you'll try this with your kids, even if they are under 8. I put up three puzzles for you to try. The answers will be below. Do try to solve 9 and 10 first without moving the discs. See what happens! Level 1 ( Puzzles 1-20) is pretty easy.They are going to have fun! You will too. 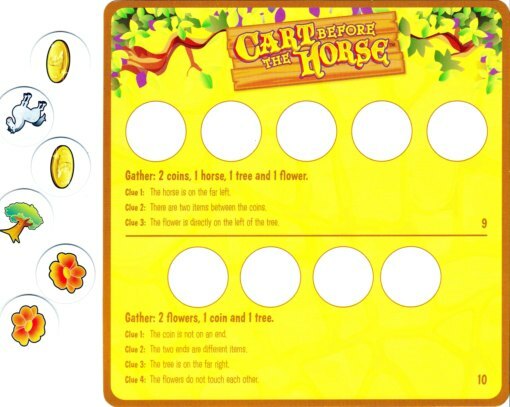 Now it's time to win your own game of CART BEFORE THE HORSE! This is a U.S. only giveaway and it ends on 12/26/12 12:01 AM. Remember to please follow the rules! Can't wait to see if you won? Buy it through my Amazon link! Sounds like an interesting game! I don't know if either kid (7, with ASD; 4 "typical" and can read on her own a great deal) is ready--but I definitely want to play! Love games like this. Maybe my kids will too! This game looks great! 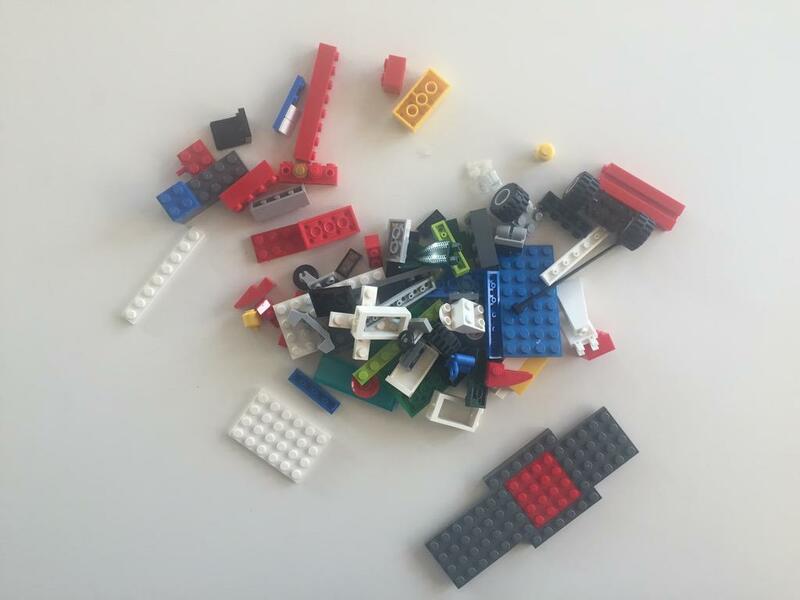 As an OT, I would love to try this with my students to work on spatial skills. I suspect my speech therapist colleagues would enjoy this game, too! solve verbal riddles with my hands... i don't think i ever have, and would love to give it a try. 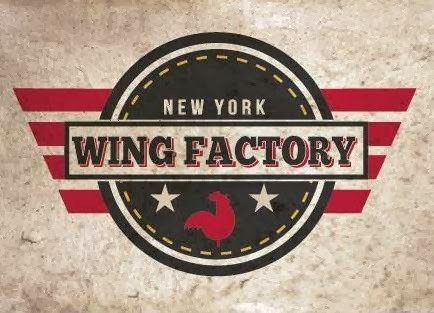 i'm a member of a mom's group (bowery babes), and we're good at recommending toys for each other. oppenheim, a little bit (i really dislike their website.) 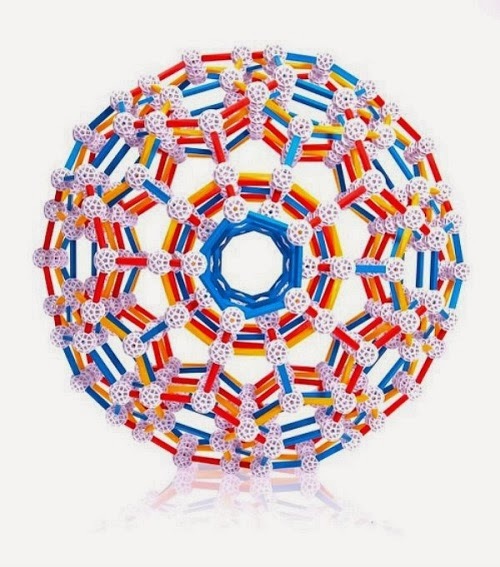 some of the design blogs i read sometimes feature beautiful toys. sometimes i go read the reviews on amazon. and toys are tools! I usually go by what they say they like. Sometimes I'll just get them something based on what I think they'll like based on their personality. I remember solving the verbal puzzles that used a logic grid to check off right and wrong answers. I think this is even better. I also like your brilliant idea of the flip book for the answers. Great problem solving on your part! I often look at Amazon recommendations. I also like to look at toy catalogs, but I hide them from my kids. I know they would find 100 things they would like!